One study estimated that only approximately 45 percent of end-of-life patients were receiving palliative care. While this number has increased somewhat, it is clear that there is a gap between the number of patients who would benefit from this type of care and those who actually receive it. Part of the misunderstanding has to do with exactly what palliative care is and isn’t and how it differs from (and is similar to) hospice care. 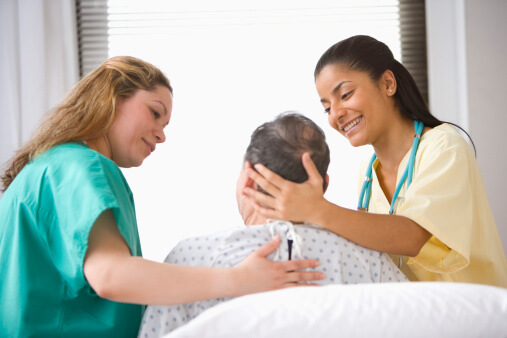 Palliative care is defined as specialized medical care for people with serious illness. Rather than focusing on curative treatments – which can and many times do continue in conjunction with palliative care – it is focused on improving the quality of life of patients, their families and caregivers. Palliative care does this by working to identify, assess and develop treatment plans for pain management and other physical, psychosocial and spiritual concerns. It is provided by a specially-trained team of doctors, nurses and other specialists and is appropriate at any point during disease progression. Hospice care, in comparison, is a type of palliative care that is usually offered to patients when curative treatment is no longer beneficial nor desired and when life expectancy is measured in months or less (the usual threshold is six months). In this case, the palliative care is focused almost exclusively on symptom relief and comfort while offering necessary emotional and other required support to patients and their families. Palliative care clearly makes a positive difference for patients. One study of cancer patients showed that this care provides better management of symptoms, enhanced quality of life, increased survival and reduced medical costs. Families and caregivers also benefit, because palliative care addresses their emotional and logistical needs. The case is so strong for palliative care that more hospitals have begun investing in specialized palliative care teams. As palliative care programs continue to look for ways to enhance patient wellbeing and improve curative treatment outcomes, many are adding or taking a second look at elements that may help achieve this goal. One such element is nutrition, which is important not only for meeting the body's physical requirements but also social, cultural and psychological benefits. Physically, making sure that patients not only get the correct nutrients – vitamins, minerals, fats, carbohydrates, protein, water – but also in the right balance is critical to helping the body replace damaged tissue, remain strong and reduce physical deterioration. Good nutrition helps patients maintain a strong immune system and reduce the risk of infection, which is usually present in a healthcare setting. While these physical benefits may not, in of themselves, stop the patient's disease from progressing, it may help them feel better overall. Psychologically, making good nutrition a key element of palliative care lowers patient stress, reduces worry and improves quality of life. Various studies have shown that good nutrition can help combat many emotional challenges of dealing with a chronic disease, including depression and anxiety. These include ensuring that patients have adequate levels of minerals such as magnesium, chromium, iron, selenium, zinc and copper, all of which have been shown to have a positive impact on depression, anxiety and mental health in general. One way to help ensure these levels are correct and in balance is to do a nutritional profile of patients entering palliative care to determine what may be required to bring them into balance. In addition to increased patient satisfaction and the possibility of improved outcomes for those patients still receiving curative treatments, palliative care brings financial and operational benefits to providers, although these benefits are not without their critics and challenges. According to The Wall Street Journal, palliative care can reduce treatment costs, help lower the incidence of repeat hospitalizations and, in the case of hospice care, reduce the number of emergency interventions that may not provide any tangible benefits to patients. And a study by Kaiser Permanente found that palliative care programs can save from $5,000 to $7,000 a patient by preventing costly trips to ERs and avoidable readmissions.